Guide to transportation in Timisoara. Where to park, airport transfers, public transportations and taxis. Everything you need to know about Timisoara. 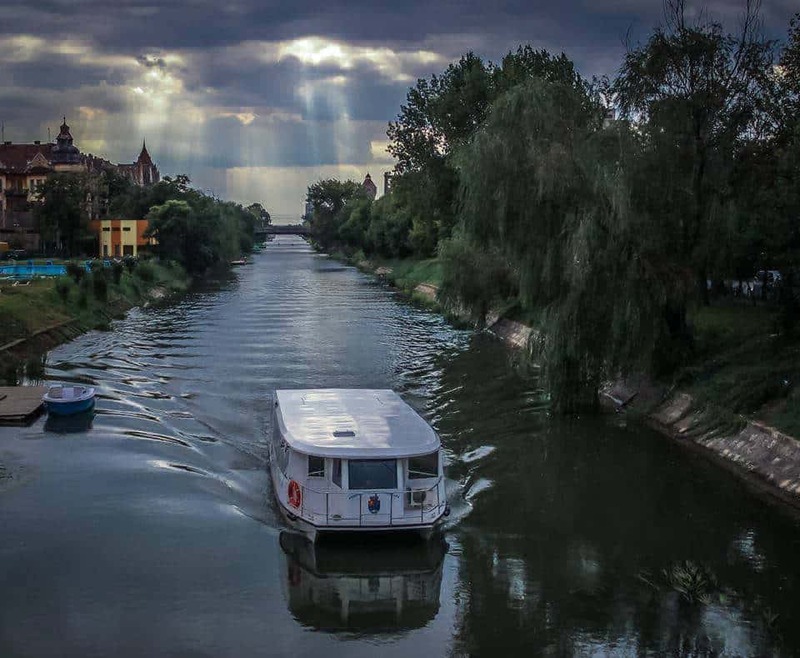 History tells us that passenger transport on the Bega river is not something entirely new for Timisoara. The old citadel of Timisoara was located in a swampy area. In older times, this location helped defend the city is care of attacks. But as the city expanded and battle techniques developed, the swampy terrain began posing a threat to people’s health and houses: building would be flooded whenever the water would rise and the humidity could cause locals all sorts of diseases. The is why, after Timisoara was freed by the Habsburgs from Ottoman rule, the city underwent dramatic changes. One of these biggest changes was the construction of the Bega canal, which began in 1728. Surrounding waters were channeled and the land was freed for construction. While initially the Bega canal was mainly used to transport goods (construction materials and products to be traded in the city’s markets), since 1868 and until the 1960s, passengers transports also took place on the Bega. Workers who lived upstream would travel to the city via the Bega to work here. 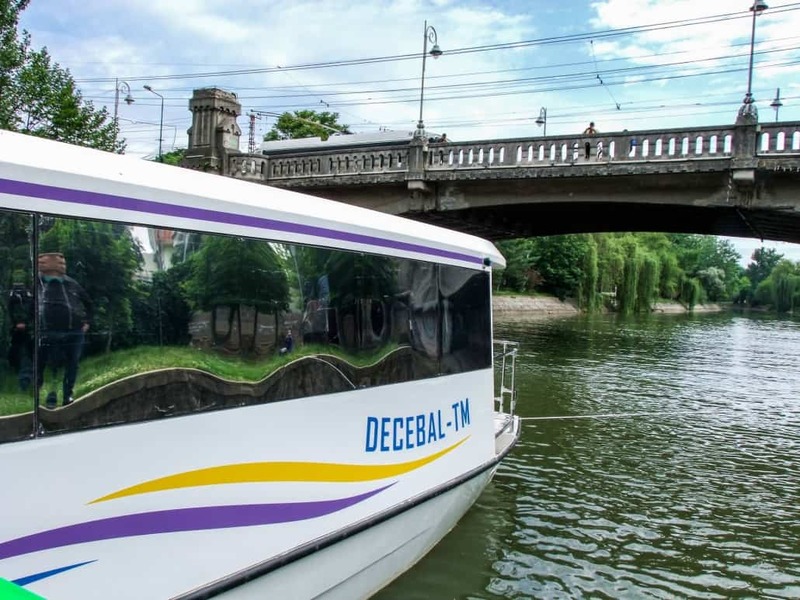 Half a century after passenger transport on the Bega had stopped, the city has a new premiere: Timisoara has become the first Romanian city which offers public transport “on water”. The Timisoara “vaporettos” were launched this year, after thorough planning and some implementation issues – this is, after all, the first time this is happening in Romania. However, they are now functional and willing to transport passengers all along the Bega. If you are interested in a city tour via water, you can certainly hop on one of the vaporettos and enjoy the view. Please note, the vaporettos don’t have any “outdoor” seats, for safety reasons. Once you hop on, you will have to take a seat for the whole journey. How much does a “cruise” on the Bega cost? Since the vaporettos qualify as public transport, you can take them for a few. The fee, however, is a small one: 1 RON for one trip. You can purchase the ticket on board. Mihai Viteazu: 7.30, 8.25 (stops at the Metropolitan Cathedral), 11.47, 12.36, 13.23, 14.10 & 14.59, 15.46, 16.33 (stops at the Metropolitan Cathedral). Dacia: 7.37, 8.32 (stops at the Metropolitan Cathedral), 11.54, 12.43, 13.30, 14.17, 15.06 & 15.53, 16.40 (stops at the Metropolitan Cathedral). Corneliu Coposu: 7.44, 8.39 (stops at the Metropolitan Cathedral), 12.01 și 12.50, 13.37, 14.24, 15.13, 16 & 16.47 (stops at the Metropolitan Cathedral). Vasile Pârvan: 7.52, 8.47 (stops at the Metropolitan Cathedral), 12.09 și 12.58, 13.45, 14.32, 15.21, 16.08 & 16.55 (stops at the Metropolitan Cathedral). Metropolitan Cathedral (Catedrala Mitropolitană): 8, 12.17, 13.06 & 13.53, 14.40, 15.29 & 16.16. Sfânta Maria: 8.05, 12.22, 13.11 & 13.58, 14.45, 15.34, 16.21. Ștefan cel Mare: 8.13, 12.30, 13.19, 14.06 & 14.53, 15.42, 16.29. Constantin Brâncoveanu: 8.22, 12.39, 13.28, 14.15, 15.02 & 15.51, 16.38. Ardealul: 7.11, 8.34 (stops at the Metropolitan Cathedral) 11.19, 12.06 & 12.53, 13.42, 14.29, 15.16, 16.05 & 16.52 (stops at the Metropolitan Cathedral). Constantin Brâncoveanu: 7.18, 8.41 (stops at the Metropolitan Cathedral), 11.26, 12.13, 13 & 13.49, 14.36, 15.23, 16.12 & 16.59 (stops at the Metropolitan Cathedral). Ștefan cel Mare: 7.28, 8.51 (stops at the Metropolitan Cathedral), 11.36, 12.23, 13.10 & 13.59, 14.46, 15.33, 16.22, 17.09. Sfânta Maria: 7.38, 9.01 (stops at the Metropolitan Cathedral), 11.46, 12.33, 13.20, 14.09 și 14.56, 15.43, 16.32, 17.19 (stops at the Metropolitan Cathedral). Metropolitan Cathedral (Catedrala Mitropolitană): 7.43, 11.02 & 11.51, 12.38, 13.25, 14.14, 15.01 & 15.48, 16.37. Vasile Pârvan: 7.52, 11.11, 12 &i 12.47, 13.34, 14.23, 15.10 & 15.57, 16.46. Corneliu Coposu: 8.01, 11.20, 12.09 & 12.56, 13.43, 14.32, 15.19, 16.06 & 16.55. Dacia: 8.09, 11.28, 12.17, 13.04 & 13.51, 14.40, 15.27, 16.14, 17.03. What do you think about this kind of public transport? Would you use it? Timisoara has had a complex history and throughout history, various nationalities have shared the city. The city has been part of the Kingdon of Hungary, under the Ottoman rule and for a long period of time, Timisoara was part of the Austro-Hungarian empire. In 1918 Timisoara, the population consisted of Germans, Hungarians, Romanians, and Serbians. Moreover, Timisoara which is one of the largest cites in Romania, will become a European Capital of Culture in 2021, which means this diversity will be celebrated further. When choosing a travel destination, the price is a very important aspect. We are happy to tell you that Timisoara is affordable for everyone. You can find accommodation for as little as 10-15 € per night, a beer costs about 1.25 €, and a lunch out is roughly about 10€. Yes, you read it correctly. Due to its location, Timisoara is just 70 km away from the Hungarian and Serbian borders. This means you can just rent a car and go for another city break while on vacation. Timisoara is just 3 hours away from Budapest (Hungary), 3 hours away from Belgrade (Serbia) and 5 hours away from Vienna (Austria). Mostly in the summertime, in Timisoara, you have a lot of festivals to choose from, like: Revolution Festival, organized by EXIT Festival from Serbia, JazzTM, Garana Jazz Festival, Plai Festival, Ceau Cinema Film Festival, Vest Fest, European Film Festival. Find out more about the best music festivals in our area in our dedicated article. Timisoara is also a good destination for food lovers and you have quite a lot of restaurants to choose from. And Romanian food is tasty! As we already mentioned, we embrace our multiculturality. Timisoara and the banat region is known as being one of the most foreign-friendly cities in Romania. This is mostly due to the fact that in Timisoara the locals have always lived together with other nationalities. It’s also a city with a lot of universities and therefore popular with young people. Most of the buildings belong to the art nouveau current, but it’s hard to define the overall architecture, as many buildings share eclectic elements. Get lost in the old city center (Piata Unirii) and visit the parks around. Don’t forget to look up, who knows what details you might spot?! Whether you’d like to simply go out for a drink or go party, Timisoara has all the ingredients for a great night. You can go for a live concert at Reflektor Venue, a party at D’arc, Scottish Pub or Epic or just enjoy a lovely dinner at one of the many cafes in the city center, like Cafeneaua Verde. Yes, almost everyone speaks English, believe it or not. This makes the city pretty tourist-friendly. The generation born in the late 80s and early 90s learned English mostly from TV (it was not dubbed back then) and from the cartoon series on Cartoon Network. For over 40 years, Romania has been a communist state, ruled by Nicolae Ceausescu. Timisoara is the city where the anti-communism romanian revolution started and from here it spread fast in all the country. Thanks to all these people we are now a European country, but the memory should never be forgotten. Make sure to visit the Communist Revolution Memorial to find out more. What did you enjoy about Timisoara? Was it the food, the people, the architecture? Or was it something else? Let us know, we’re curious to find out! Every time you visit a new city and arrive there by plane, one of the first problems you encounter is the airport transfer. What are your options if you visit Timisoara? How to get from Timisoara airport to the city centre? Public transport, Uber or taxi – see which best suits you. Public transport is the most affordable way to reach the city from the airport. Within 30 minutes, you can arrive near the city center, the last bus stop being “The Cardinal Points”. The bus stop is just 5 meters away, once you exit the airport. The ticket price is only 2.5 lei (about 50 cents) and you can find tickets at the newspaper stand in the airport. You can also pay via SMS, using the 24Pay app which you can find on PlayStore or on the AppStore if you are an iPhone user. The only downside is that the bus only leaves once every hour. For a detailed schedule, see the airport bus timetable here. Disclaimer: The timetables were taken from the Public Transport website, traffic conditions may change these times. For going from the city to the airport we recommend arriving at the bus station earlier or taking a taxi or an Uber. This should be your last option if you are planning to go from the airport to Timisoara. In front of the airport there are a lot of “private” taxis which charge you extra. A taxi ride should not cost you more than 70 lei, or 18 Euros. Make sure you ask the taxi driver which is the approximate fare to take you to your accommodation and also make sure they start the fare machine. Some taxi drivers will be nice and honest, but better safe, than sorry! Hopefully, we’ve managed to save you some time and some frustrations with this article about how to get from Timisoara airport to the city. We are curious: which option did you take and how did it go? Enjoy your stay! We’ve written before about how to get around in Timisoara, but we know that you budget travelers out there are also wondering what is the cheapest way to get around in Timisoara. While walking is always an option (Timisoara is a big city, but its center is not that big), the next best choice is public transport. What should you know about the public transport in Timisoara? Reliability: You’re probably wondering how reliable public transport in Timisoara actually is. Well, it is usually reliable, but delays happen. The most reliable lines are, according to a survey made by local authorities, the bus line no. 33 and the tram line no. 9. Luckily, arrival times are displayed in some bus/tram stations. You can get these estimates on the official Timisoara public transport (RATT) app, which you can download from here. The menu is in Romania, but it is quite intuitive. You just have to search for the line number, the station you are in and your destination. Costs: One tram/bus ticket costs 2 RON (less than 0,5 euro), while an express bus ticket costs 2,5 RON. Express buses are buses with routes across the city, making it easy to access places in opposite places of the town. These buses also have fewer stops and thus faster. If you are staying long-term, you can get a subscription – there are various kinds available, you can find the full list here. This means you will also have to get a transport card – this is efficient even if you are not interested in any of the subscription models, as you can simply put money on your transport card and use it anytime you travel. Cleanliness: Sorry, but don’t expect public transport in Timisoara to be very clean. If you’re lucky, you’ll ride a clean tram. If you’re unlucky, then you won’t. We’re working on this. Timetable: Public transport in Timisoara runs from 5 a.m. to about midnight. After midnight, you will have to walk or take a taxi/uber. Buying tickets: there are special shops for this in the vicinity of the bus/tram stations. If you can’t find any, go to the nearest shop or newsstand and ask around. They sometimes sell bus tickets too. You can find a map of the official RATT ticketing points here. the E4 line: leaves from next to the citadel, stopping a few times before reaching the airport. The bus leaves once per hour. the E4/ line (on the bus display, there is a “/” across the “E4”): connects the train station with the airport. As for public transport, any of the following lines will take you there: 1, 8, 9, 11,14, 18, E1, E4/. If there is anything else you like to know about public transport in Timisoara, don’t hesitate to get in touch! We’ve tried to make this article as informative as possible, but we’re always open to feedback! Traveling to Timișoara and not sure how to get around in Timisoara? Wondering if you can “walk it through” or how much it would cost you to take a taxi? We’ve got you covered! When traveling to a new city, you usually want to know more about how to get around. Some cities have traffic issues, others don’t, some have good public transport, others don’t. 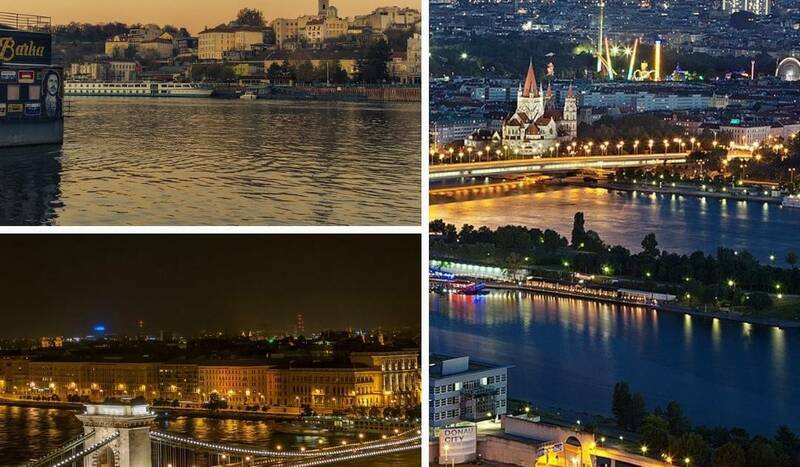 Well, what about Timișoara? Timișoara is a large city by Romanian standards. However, if you come from a big city or are fond of city breaks in huge cities, like Berlin or Barcelona, you will find that it’s really not that big. Most of the things you’ll want to visit are within walking distance of the city centre. It’s highly unlikely that you’ll be staying in the outskirts of Timisoara, but it shouldn’t take you more than one hour to reach the city centre from anywhere in the city anyway. If you walk rather fast, you can probably cross the whole city in about an hour from its more popular neighborhoods. We’ll have to be honest here: public transport in Timișoara (and generally in Romania) isn’t great. Timisoara does not have a subway/ metro line, so, unfortunately, most public transport will be influenced by the overall city traffic. Trams are usually a bit faster, as they don’t interact with other transportation lanes very often. Buses on the other hand, most often share the same road with the many city cars. On the bright side, public transport in Timisoara is pretty cheap: one bus ticket costs 2 lei, while one express bus ticket costs 2,5 lei. This translates to less than 0,5 euros. Express buses, unlike the other buses, don’t stop so often and normally travel from one side of the city to another. You can buy the tickets from special shops in the stations or sometimes even in small shops around these stops. Not all the stations have tickets shops, so if you’re confused, just ask around. But here’s an unethical tip for you: in Timisoara nobody asks for your ticket once you get on the bus/ tram. The tickets are only checked by patrols that come aboard every now and then. So, if you’re not traveling far and feeling adventurous, you can also take a chance. You should also know that while some public transport stops have displays that show when the next bus/ tram is going to come, these aren’t always reliable. As for public transport routes, you can check them out on the official public transport website, or by downloading their official app. The routes aren’t really displayed properly elsewhere – neither in the buses/ trams nor in the bus stops. That’s why, if you’re considering public transport, it’s best that you first ask a local for the best lines to take. If you normally use Uber, then you will be able to keep using it in Timisoara. Most of the drivers are really nice, speak English and Uber is getting more and more popular in Romania. Taxi fares are pretty low, considering other European cities, costing about 2 lei/ km (less than 0,5 Euro). But there’s always that small chance that you will also get a city tour included – that is, the driver will take the long way, to charge you more. It’s up to you to decide if you trust that particular driver or not. Biking has become more and more popular in Timisoara in recent years. Designated bike lanes have been introduced and many people prefer to bike in order to avoid the city traffic. If you have friends from whom you can borrow a bike, you should be able to get around just fine. But make sure you lock your bike carefully – they do get stolen quite often. You should probably know that Timisoara, even though not a huge city, has an issue with traffic and parking spots. Parking is allowed around the city centre, but don’t expect to find a spot easily, especially during work hours! If you’re coming to Timisoara by car, we advise you to find a nice parking spot near your accommodation and then forget about it. Because the problem of parking is a bit complex, we have dedicated a whole article to the topic. Click here for our tips of what to expect when traveling by car to Timisoara. If you are travelling to Timisoara, you are probably going to get there either by plane or by car. And you’re probably wondering how car-friendly the city is. In order to help you out, here are some insights – our personal opinions about the traffic in Timisoara, as well as some parking tips that you might find useful. What we can tell you for sure, is that Timisoara is a safe city. In Timisoara, and generally in Romania, a lot of people own cars. It is our favourite way of getting around – this might also have something to do with the fact that public transport isn’t very reliable. Traffic in Timisoara can be pretty bad, so we really don’t advise you to choose seeing the city by car, especially during rush hours and in the centre of the city. If you travel by car to Timisoara, it might be best to find a decent parking space for it and forget about it for the rest of your trip. There aren’t many parking spots in the centre of the city and they are almost always taken because, as we already mentioned, Romanians love their cars. If you want to park your car in the city centre you normally have to pay for it, if you are parking anytime from Monday to Friday between 8 a.m. and 5 p.m. It’s free outside of these hours and during the weekends. However, this seems to just apply to the locals. Our mayor has reportedly said that foreign cars can’t really get fined for not using the local parking system, called TimPark. We don’t really get it either, so let’s just say that Timisoara is very friendly with its tourists. If however you are traveling with a Romanian car, be it rental, or belonging to a friend, you can (and probably will) get fined. Keep in mind, the TimPark system only applies to the city centre and to a few busy streets. These streets are marked with colourful signs – red, blue, yellow and green, each representing a different parking area with a different parking price. You can pay this fee either by sending a text message (instructions should be on the signs), of a voucher (which you can buy from the same places that sell bus tickets). If you are not staying on one of the TimPark streets, you can safely leave your car parked there. If you are wondering how you can get around in Timisoara without a car, there are plenty of options: the city centre can be best enjoyed by walking, but using public transport or biking are also good options. For more details, check out our article on how to get around in Timisoara.